Jazz up your kitchen gadget collection with the set of everyday tools from Slice. 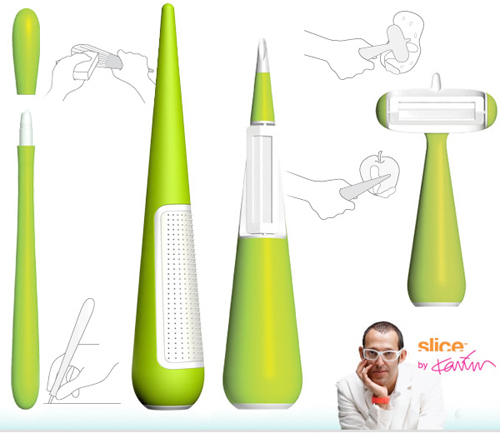 Designed by Karim Rashid, the set includes (from left to right), precision cutter, a grater, a vegetable peeler and a y-peeler. Beyond the classy styling, these tools all utilize ceramic technology as opposed to traditional stainless steel. The ceramic blades used in the peelers and precision cutter stay sharp and have the added bonus of never rusting. The grater uses rows of ceramic teeth as opposed to stainless steel holes, so unlike a traditional microplane or grater, food particles will not get stuck in hard to clean places. The entire collection is dishwasher safe and affordable at $14.99 for the grater and peelers, and $6.99 for the precision cutter.